There is no one standard carry on luggage size or international carry on size. Each airline comes up with their own restrictions on size, weight, and number of items allowed in the cabin. In order to help you figure out the right dimensions for your carry-on bag, we’ve compiled the ultimate guide to hand luggage sizes and weight restrictions. 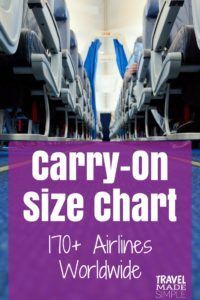 You’ll find carry-on restrictions and limitations for more than 170 airlines worldwide right here in the only carry-on luggage size chart you’ll ever need. 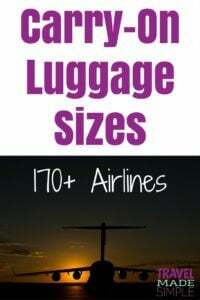 Travel Made Simple readers have purchased the following carry on size luggage from Amazon to help them stay within the carry on restrictions of many airlines and fly without the hassles and expense of checked luggage. Read more about the best carry-on luggage and how to pick luggage here. Chart and airline pages updated as of May 2018. All information is pulled from airline websites as a resource. 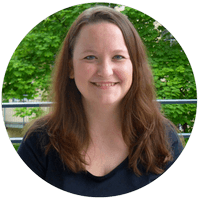 Airline websites are the authority and can change at any time. We are not responsible for discrepancies. Using the carry-on luggage size chart: Filter by region. Sort by airline name, dimensions, or weight. Switch between imperial and metric. Click on the airline name for more info on number of items allowed and other variations in the airline carry on luggage rules. Have more questions about carry-on? Click here to jump to the carry-on FAQs. Carry-on luggage is any bag you bring with you on the airplane. It stays with you, as opposed to checked luggage, which goes in the cargo area of the plane. Carry-on luggage is sometimes referred to as cabin luggage or hand luggage, depending on what country you’re from. What size is carry on luggage? This isn’t always an easy question to answer because carry-on luggage size varies from airline to airline. So if you’re trying to determine what size luggage is carry on, you’ll need to look at the airline you’re flying with. Lucky for you, we’ve put together the most comprehensive carry-on size chart on the internet with over 170 airlines from around the world. What is TSA carry-on size? Just as there is no one standard carry-on luggage size, there is no TSA carry-on size. Your carry-on bags must fit through the X-ray machines, although the exact size of the machines may vary from one airport to another. Follow your airline’s rules about what size carry-on luggage they allow, including other airline carry on luggage rules such as luggage weight and number of items allowed. Check out our carry-on luggage size chart above for more info. What is international carry on size? There is no official international carry on size. Occasionally you’ll find an airline with different carry on rules for international flights vs domestic flights, but the actual size allowed still depends on the airline. Some non-US airlines have smaller hand luggage size limits than US-based airlines. 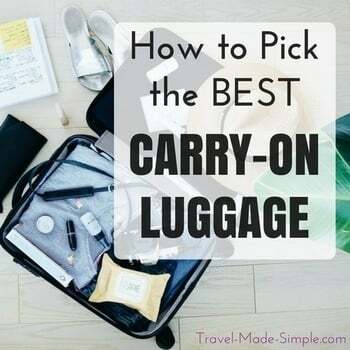 If you will be flying with multiple airlines, which often happens with connecting flights on an international itinerary, check the carry-on size allowances for each airline you will be flying with and go by the most restrictive/smallest carry-on size allowed. The dimensions for carry on luggage are found by measuring your bag’s height X width X depth. It’s important to know how to measure carry on luggage so you’ll know if your suitcase or backpack will fit within the airline’s carry on luggage rules. To measure your bag, measure from where it sits on the floor up to the highest point on the bag, since all wheels and handles must be included in the dimensions. Note that some luggage companies will list a suitcase as a 22 inch suitcase, as an example, when in reality that 22 inch height only includes the body of the suitcase, not the wheels and handles. Remember the airline carry on dimensions are what matter. What is the weight limit for carry on luggage? As with size, the weight limit for carry on luggage varies from airline to airline. Some airlines are more strict than others, while a few even simply state that you must be able to lift your luggage into the overhead compartment without assistance from an airline employee. It’s always best to check the airline’s carry-on luggage weight allowance and take note of whether the weight limit includes your personal item or if there’s a separate weight limit for the personal item. 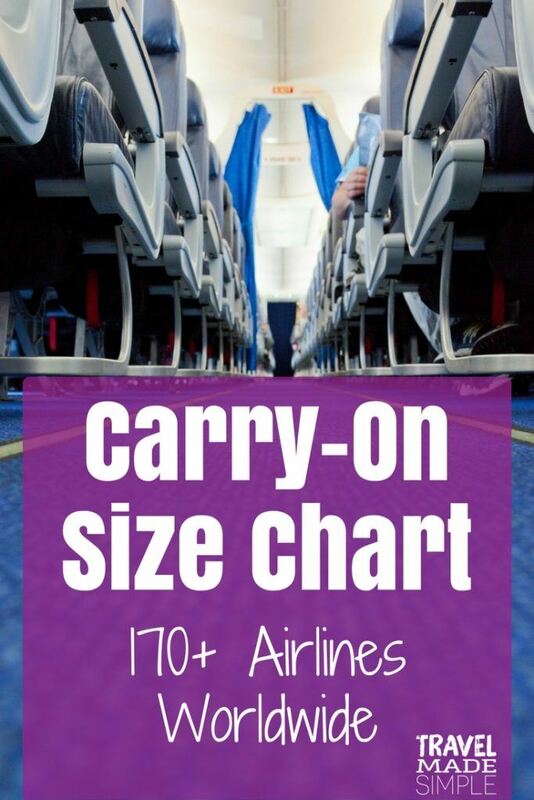 Our carry-on size chart includes weight limits for over 170 airlines, and you can find more information about number of items and how the weight limit is applied by clicking the name of the airline on the chart. Many, but not all, airlines allow passengers to bring their main carry-on luggage plus a personal item into the cabin with them. A personal item is a smaller bag like a purse, briefcase, laptop bag, etc. It generally needs to be small enough to fit under the seat in front of you, but some airlines give specific dimensions for your personal item. Sometimes the airline also specifies a weight limit for the personal item that is separate from the weight limit of the main carry on bag, but sometimes the combined weight limit is given. And some airlines don’t specifically list a weight limit for the personal item. What is allowed in a carry on bag? Many items are allowed in a carry on bag, such as clothing, shoes, most electronics, etc. Toiletries and other liquids are allowed as long as each container is 3.4 ounces/100ml or smaller and all containers fit into a 1 quart/1 liter zip top bag. You are also allowed to bring an empty water bottle of any size, but the key is that it must be empty! Can you take hair straighteners in hand luggage? Plus info on hair dryers and curling irons! Can you bring matches or a lighter on a plane? Can you take a vape on a plane?